Around half of all puppies purchased in the UK come from puppy farms. But what happens to their parents? Thousands of dogs around the country right now are being treated like breeding machines to line the pockets of puppy farmers. Some puppy farmers have up to 200 breeding dogs at any time, making this the worst industrialised cruelty to dogs in British history. At the end of their peak breeding life a breeding dog on a puppy farm will be abandoned or killed. They are no longer profitable to the puppy farmer, after all. Very few of them are given a second chance at life. This is the story of Harry, one of the lucky few ex-breeding dogs who are given a second chance. Karen, a Naturewatch Foundation supporter, wanted to share his story to show the impact a puppy farm environment has on innocent dogs, and why this cruelty must be stamped out forever. I retired from the NHS during April 2010 and as my husband worked from home we decided to have a second dog. We were already the proud owners of a five year old small collie cross called Maisy, adopted from a rescue group called Lizzie’s Barn. 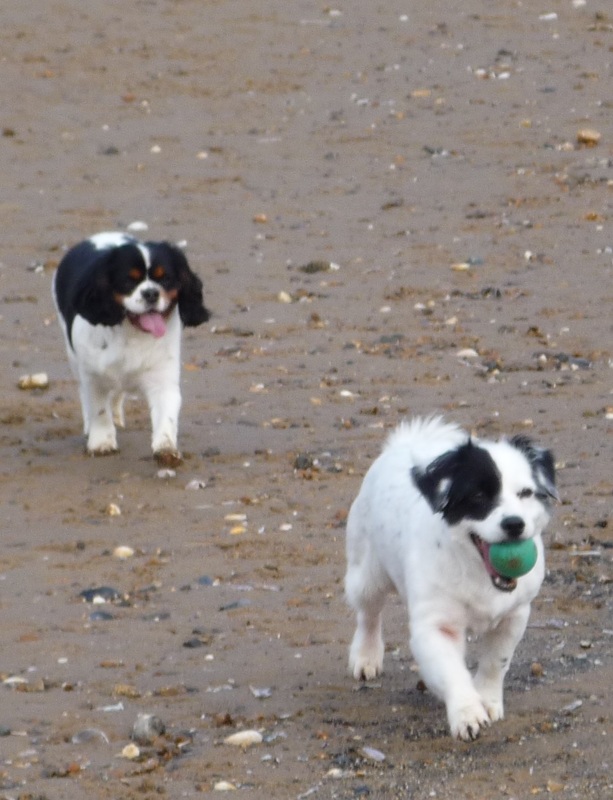 Our very first rescue dog had been a Cavalier King Charles Spaniel (CKCS) called Misty and she had been a wonderful girl, so we decided to adopt another CKCS. an initial telephone interview with MTAR who were unable to give any details about his history, stating his life started when they collected him from the puppy farm. His foster carer, Diana, then contacted me. She told me he had been neutered, microchipped, vaccinated, and wormed by MTAR. Diana told me his ears and teeth had required attention too due to poor care in the puppy farm (although he was not the worst she had seen). Subsequently we had a positive home assessment and Diana invited the three of us to meet him. The visit went well, and our boy came back with us to his new home. Once home we gave him a name – Harry. He was a frail and timid little dog with very wobbly back legs due to being confined to a cage most of his short life. His tail was scruffy and the hair broken off. The lower part of his coat was stained orange due to Harry being left to lay in his own urine. I gave him a bath, cleaned his ears trying to remove the black discharge present but they continued to have a very bad smell. His nose was dry and crusty. I took Harry to the vet and as expected he had an infection in both ears. His wobbly legs were due to muscle weakness, which would improve with gentle regular exercise, gradually building up his activity over time. Indoors, Harry was frightened of shadows on the wall at night, any sudden movement and anyone who came to the house. He would tuck his tail between his legs and try to make himself as small as he could. He did not like being touched or stroked, but he did like his food and did not waste a single crumb. Harry was not house trained, living outside before being taken in by Diana. Outside, Harry was frightened of everything. Even if a leaf touched him, he would jump and try to run away. Harry did not want to venture through the gate initially, so I walked him around the garden which he was happy with until curiosity got the better of him and he wanted to follow Maisy when she went out, so he did. Harry walked well on the lead and eventually was happy to run free with Maisy. Maisy was a wonderful mentor to Harry, she was intelligent, confident and the cleanest dog ever. Maisy kept Harry in order and he loved her for it, as long as she was near him, he could cope. He copied everything she did - good and bad! Harry gradually settled in to his new home routine, although he tended to panic during visits to the groomer and vet. When we played with Maisy and Harry he didn't really understand, so he would get excited and start dashing round the room in circles which was quite comical. Maisy had a swelling in her groin during January 2014. She underwent surgery for what was hoped to be a simple lump removal, however it was revealed Maisy had an aggressive Lymphoma. She deteriorated rapidly and died five days after surgery. She was just eight years old. We were devastated. Harry was confused and lost without her, he kept looking for Maisy and regressed. I had remained in contact with Diana and we talked about how losing Maisy had affected Harry. She said if we could manage our pain about Maisy, we needed to find him a new companion. It is well known that puppy farm dogs cannot cope without another dog for support. 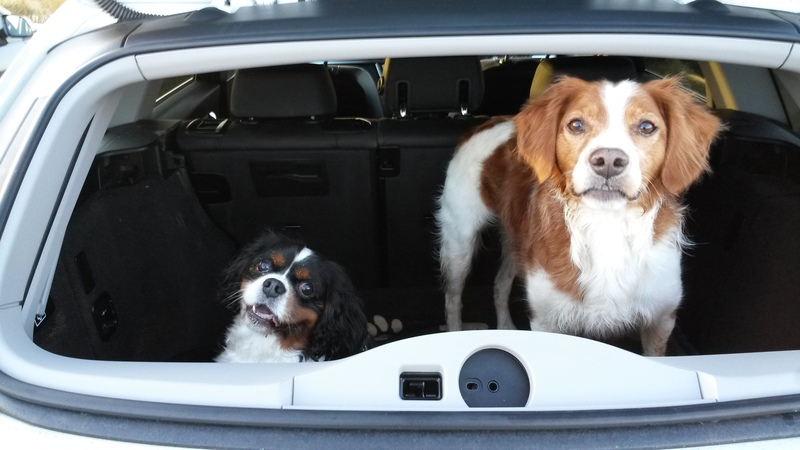 We looked again to MTAR during February 2014, there was a rather good looking male five year old Brittany Spaniel called Leo, who needed a home quickly. His family had placed him in rescue as they no longer had time for him and Leo was distraught. I read about the breed to ensure Leo would be a good friend for Harry and then started the adoption process. From the very first day Leo became Harry's best friend. Leo is a very attractive, confident, self-assured and active dog. He does not dominate or bully Harry but shows him affection and encourages Harry to play. Last year we moved close to the beach. Leo is an excellent swimmer, Harry enjoys the sea and will paddle in water up to the top of his legs. 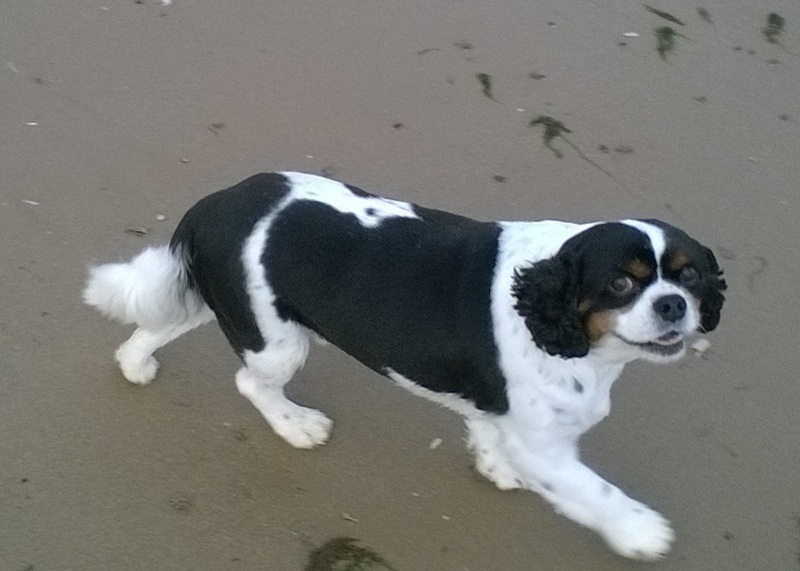 When Leo runs along the beach, Harry joins him until he runs out of stamina and then comes back to us. We think Harry has flourished since we moved here. He is now seven years old, and it has taken over five years for him to develop his cute and cheeky character who just loves to be brushed and comes looking for fuss now. There is such a difference between our two dogs, one that was denied puppyhood like Harry and the other who was properly socialised. Harry still panics when he is out of his comfort zone and can become quite frantic, especially if Leo is not around, so where possible we do try to keep them together. Harry enjoys watching TV, especially the wildlife programmes (the animal sounds fascinate him). He is very handsome with a lovely soft shiny coat, he loves food (a little too much so we have to keep an eye on his weight) which may come from his puppy farm days of being underfed. He has enjoyed good health but a heart murmur was diagnosed recently. We’ll be giving him all the help and support he needs to continue living a long and happy life. Let us hope the outcome is good for our lovely little boy. In addition, I cannot thank Diana enough for giving Harry the right start on his road to rehabilitation, her dedication and friendship is appreciated. Heart murmurs are a common condition in young Cavalier King Charles Spaniels, which is why responsible breeders do not generally breed them before the age of five years*. 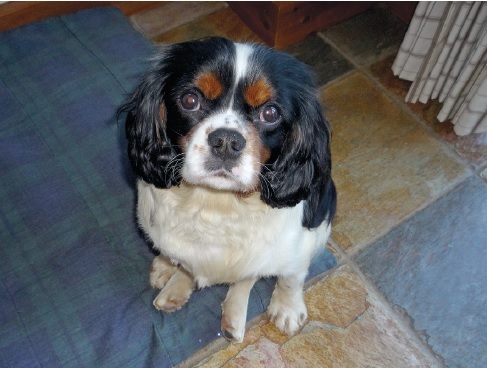 Irresponsible breeding of dogs by puppy farmers can result in the hereditary continuation of this disease in the breed, meaning dogs like Harry and their progeny may suffer. Our sincerest thanks to Karen for sharing Harry’s story with us, and for giving him, Leo, Maisy and Misty a loving home and family. Think you’ve got what it takes to give an ex-breeding dog a home? Or maybe you’d like to adopt a dog, but don’t know where to start? Check out one of these great animal rescues.